How well do you know hummingbirds? 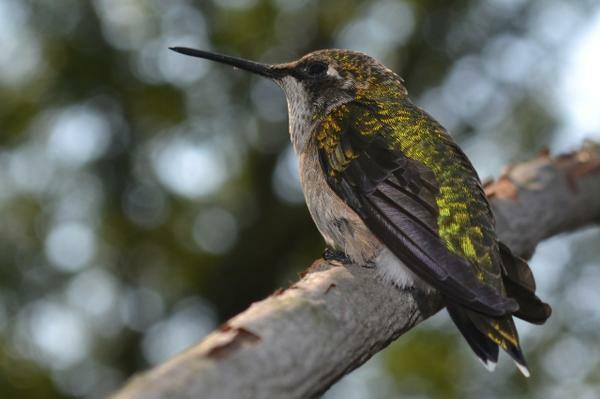 In the first year, few if any hummingbirds found our feeder. By the second year, we were thrilled to see them regularly – flitting around and sipping the sugar water I had prepared for them. 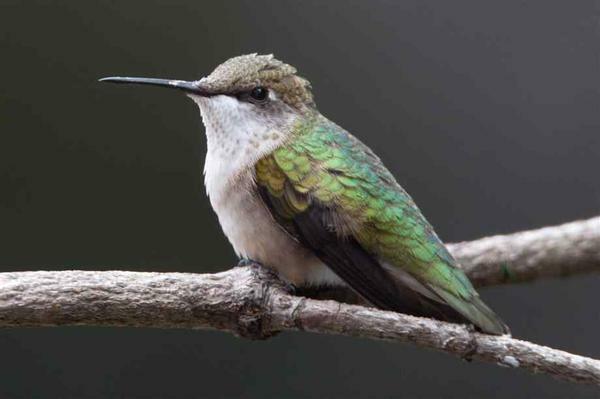 Most years we see only two hummingbirds at a time, or three at the most. It’s hard to count them, because they rarely sit at the feeder together. You have to count them mid-air. They are so small and they move so quickly that we have not been able to notice individual differences. Maybe there are actually quite a few hanging around, but we usually only see one or two at a time! One thing we’ve noticed is that they don’t seem to be very kind to each other. We have occasionally seen two birds feed at the same time, but that’s the exception. Usually one feeds and intimidates the other one into leaving. We watch the drama, hoping they both manage to get enough to eat. 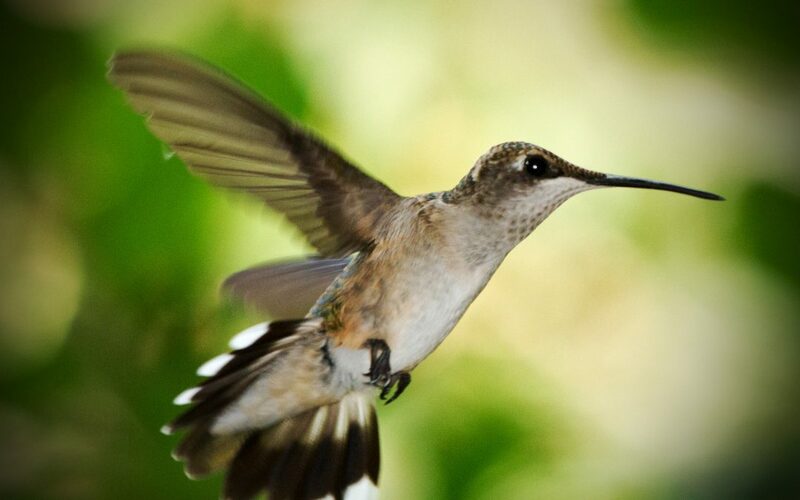 This morning Neil commented on the “hummingbird dance” going on outside the window. One bird that we had identified as a female (no ruby ring around her throat) seemed determined to keep the other one from landing on the feeder. If the second bird tried to land, it was run off by the first bird who sometimes took up a guard position on a nearby tomato cage from which she could launch an attack on intruders.But the cost to the first bird was huge! She couldn’t let down her guard long enough to eat, even when she was sitting alone on the feeder and no other bird was in sight. She was so protective of her own needs that she was not meeting them! Watching that interaction brought up a lot of thoughts in my mind about how we human beings treat each other and ourselves. We often exhibit similar behavior, perhaps not quite so overtly, when protecting what is “ours” from others. But we can also find that we protect ourselves from ourselves. Parts of us can resist letting go of old habits and ways of thinking about ourselves, even if they are not serving us well. We can have dreams and hopes of growing and learning and contributing more than we are at present, but that part of us can be held back by voices of resistance to change. It can feel dangerous to let go of familiar habits and ways of thinking, so we protect those parts of ourselves, even when that protecting keeps us from moving toward our goals! “In my initial eagerness to learn more about ADHD, I read one or two books, went to several CHADD presentations and support group meetings, met several times with a psychologist, and then received an official diagnosis and a series of prescriptions from a psychiatrist. Medications seemed to have more side effects than benefits for me, so I stopped taking them and tried instead to focus on forming some new habits of more organized, disciplined functioning. “But the image I created of my future self as disciplined and organized scared me into inaction. That image seemed to mean an almost literal death of the only self I had ever known and the replacing of it with something totally foreign and robotic. The resulting, desperate, inner resistance prevented me from making any real progress. “Some of the characteristics that I was clinging to as defining me were positive ones, such as creativity and spontaneity. But these were thoroughly mixed in with other characteristics that caused me trouble such as disorganization, time blindness, procrastination, etc. Sometimes those of us with ADHD sabotage ourselves in the belief that we are protecting ourselves. Familiarity feels safe, even when it isn’t. Change can definitely feel like a threat. Getting clear about the direction we want to go, sometimes with the help of others, can be a good first step, but the first action steps in that direction may need to be tiny. 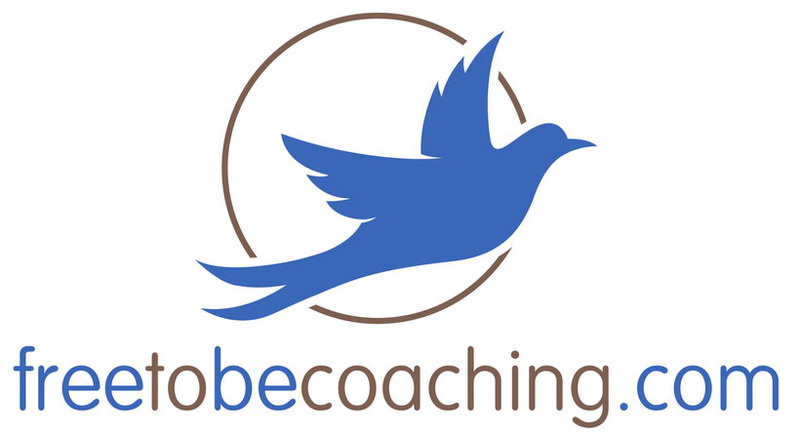 When we start moving in the desired direction but the change is minimal, that is much less threatening and opens us to embracing a growth mindset, rather than a fixed mindset (as described by Carol Dweck in her many writings).Ultimately through the help of coaching and his own determination, Neil came into a growth mindset about his ADHD characteristics, learning that structure can be liberating and systems can free one to accomplish even more.